Orbit diagram of asteroid 2017 AG13, which flew by Earth on Jan. 9, 2017. 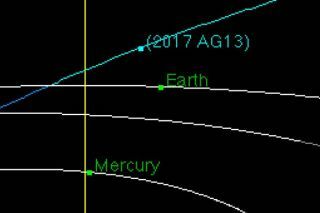 A smallish asteroid zoomed past Earth this morning (Jan. 9), just two days after scientists first spotted the space rock. The asteroid, known as 2017 AG13, flew by our planet at just half the distance from Earth to the moon today at 7:47 a.m. EST (1247 GMT). (On average, the moon lies about 239,000 miles, or 385,000 kilometers, from Earth.) You can learn more about today's flyby in this video of asteroid 2017 AG13 from Slooh.com, which includes details on the space rock from Slooh Community Observatory astronomer Eric Edelman. 2017 AG13 was discovered by the University of Arizona-based Catalina Sky Survey on Saturday (Jan. 7). Initial observations of the object show that it takes about 347 Earth days to circle the sun, on an orbit much more elliptical than that of Earth: 2017 AG13 gets as close to our star as 0.55 astronomical units (AU), and as far away as 1.36 AU. One AU is the average distance from Earth to the sun — about 93 million miles, or 150 million km. Earth's orbit is nearly circular; the planet never gets closer to the sun than about 0.98 AU, or farther away than 1.02 AU or so. Surprise flybys like the one just performed by 2017 AG13 are far from unprecedented. Millions of asteroids are thought to cruise through space in Earth's neighborhood, and astronomers have detected just 15,000 of them to date. The good news is that the vast majority of the behemoths — the ones capable of causing damage on a global scale if they were to hit Earth — have been discovered, and none of them poses a threat for the foreseeable future, NASA researchers have said.